Shane Carruth’s extraordinary sci-fi drama revolves around four scientists inventing a special one-of-a-kind machine in their garage. The contraption they build seems straightforward to use at first but complications arise as the story moves forward. The dialogue is shop talk babble we barely understand. As we fight to follow the events, some elements become clear whilst others even more puzzling. 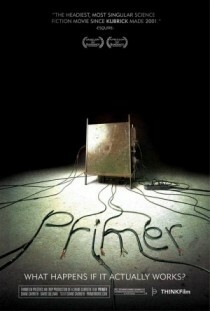 Primer – winner of best drama at Sundance 2004 – is a film for those who don’t mind making an effort whilst being entertained. The reward is a fascinating experience. Once you have seen this film – and not before! – go and investigate what the totally budget was for making it. Your jaw will drop. You can find more information on this U.S. film on Wikipedia and IMDb. Ignore the mediocre IMDb user rating; this film is original and very well made.